New with OSm 6.5, InvestigationManager is a lightweight but exceedingly powerful, virtual server application that allows rapid search and data-mining on multiple EndaceProbe™ Analytics Platforms simultaneously. 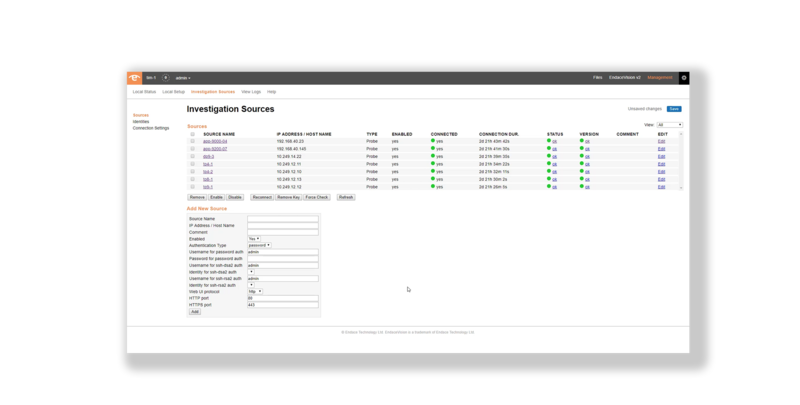 Using InvestigationManager, analysts can conduct searches across groups of EndaceProbes, or even all the EndaceProbes in an EndaceFabric™, simultaneously. Administrators can define which EndaceProbes in an EndaceFabric are attached to a specific InvestigationManager instance, allowing EndaceProbes to be logically grouped - for instance by team or region - giving administrators fine-grained control over which individuals and teams have access to the recorded packet data on specific EndaceProbes. In previous versions of OSm, centralized search was provided through EndaceCMS™ Central Management Server. With the release of OSm 6.5, EndaceCMS becomes purely a management element for managing appliances in the EndaceFabric and performing centralized management functions such as upgrades and user provisioning. From OSm 6.5 onwards, centralized search and data-mining is now done using the new InvestigationManager virtual appliance. 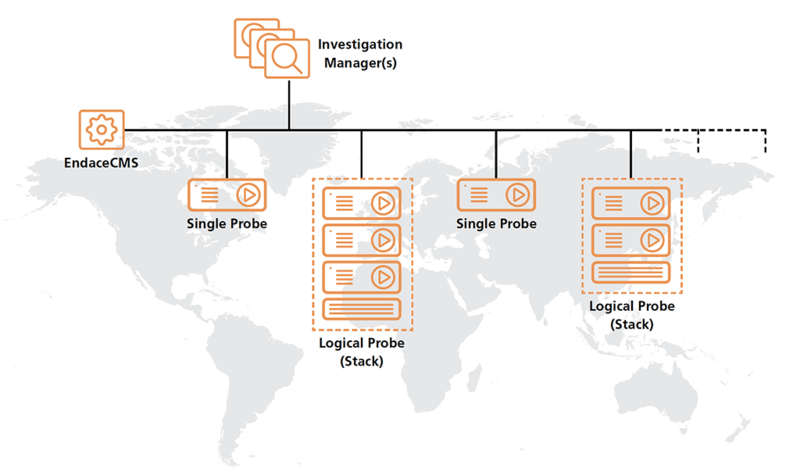 Customers can deploy as many InvestigationManager instances as they wish, to provide search and data-mining for multiple groups, and to logically group EndaceProbes for searching. Separating these two functions - administration and search - allows for greater scalability and enables faster search and data-mining for network-wide searches as the demo video below shows. Watch the short, 2 minute video to the left for an overview of the architectural changes with OSm 6.5. 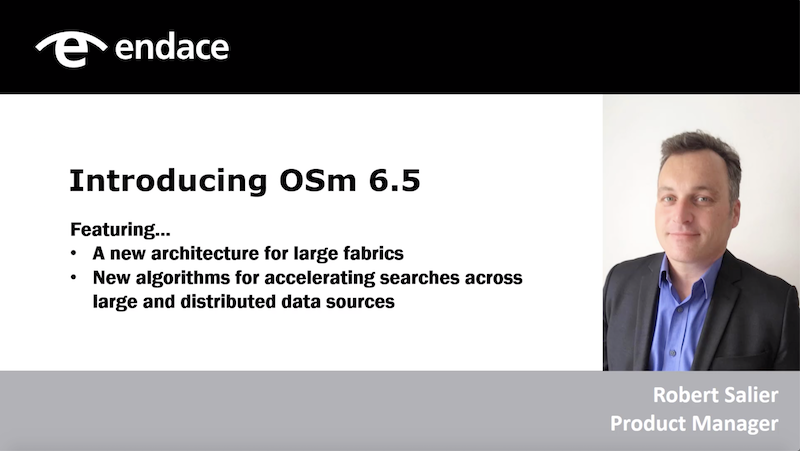 OSm 6.5 introduces a new, rapid search capability that leverages the horizontal scalability of the EndaceFabric architecture to enable "needle-in-the-haystack" searches for packets-of-interest across petabytes of distibuted, recorded packet data in under a minute. This is a game-changer for analyst productivity. 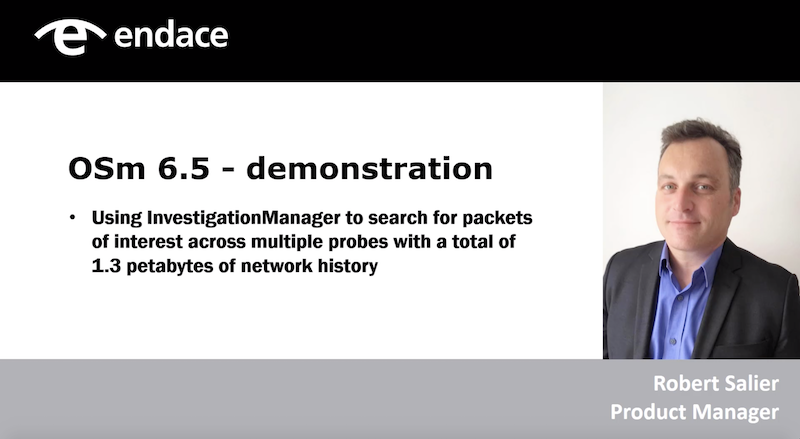 This short, demo video shows a search for specific packets-of-interest across more than a Petabyte of Network History distributed across seven EndaceProbes - some based in the US and some in Asia Pacific. InvestigationManager will run in VMWare, KVM environments or in the EndaceProbe's built-in Application Dock™, hosting environment on either an EndaceProbe or on a physical EndaceCMS appliance. On ApplicationDock, one instance of InvestigationManager requires a Single Dock instance.